The yard specializes in custom design, building, and restoration. 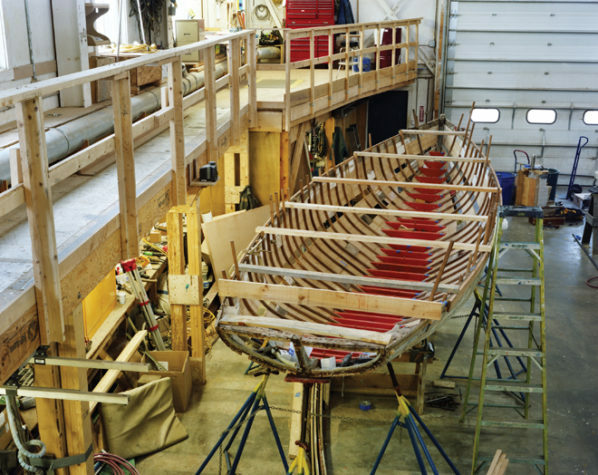 Italong with the towns eight other boatyards and WoodenBoat Magazinehas transformed Brooklin into an epicenter of wooden boatbuilding. (building) In 1960, E. B. White’s son, Joel White, took over a boatyard built inside the Ramsdell Fish Packing Plant, a sardine cannery in Center Harbor. Since the 1970s, Joel and his son Steve focused more on custom yachts than on commercial fishing vessels. The shop’s concentration reflects the reputation of Eggemoggin Reach, an area known for sailing. (hull) This 1923 Herreshoff “S” underwent a restoration this winter. “Because it’s a historic vessel, we are trying not to redesign it,” boatyard president Steve White says. “The previous owner had installed an outboard. We don’t intend to put it back in.” Next to this hull is a fiberglass 1964 powerboat the yard is working on. (door) The shop is 120 feet long, 60 feet wide, and four stories tall. Last June, the boatyard launched its largest project to date, a 90-foot yawl, the Bequia, from the space. The towering workspace can also accommodate powerboats, which can have even larger hulls and housing.